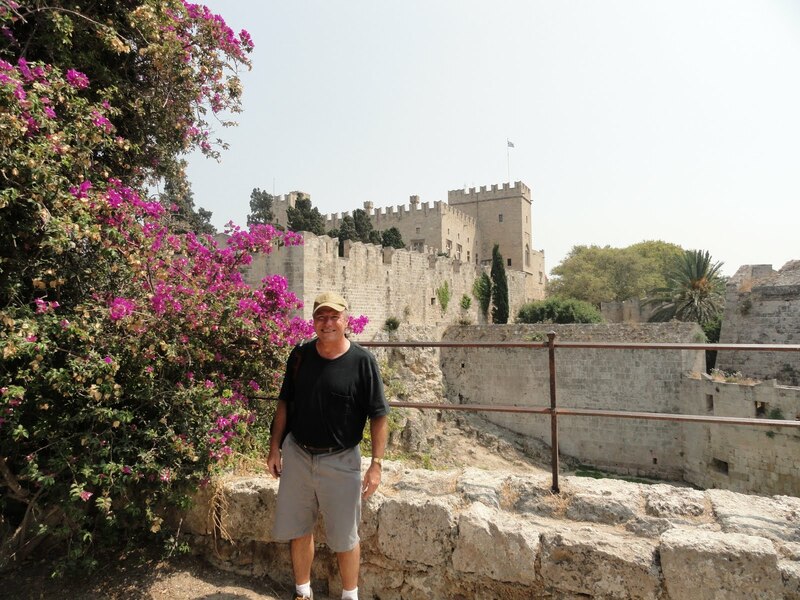 We took a hasty, OK—rash--decision to take advantage of a local travel agency offer of room and half board for little more than the price of airfare, and dashed off to Rhodes for three days. 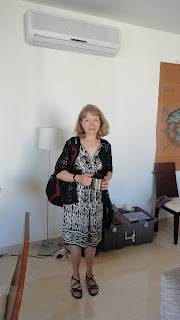 We had spent all of July living through CELTA, K’s intense ESL teacher training course. T was a major hero, doing all the shopping, cooking , laundry and otherwise keeping the world at bay, staying up late listening to K run through her teaching practice lessons, offering ideas , and bearing the occasional primal scream from his wife, who slept way too little the entire month. They made it through. She passed. Here is K as she set out the first day to class, unaware of the trials to come. And her fellow CELTA students and the trainers. The 17 students hailed from 8 different countries, and 14 of 17 were already teachers. The course finished July 30. August 3 found us in Rhodes. So, relaxing in Rhodes, we hear about the brief skirmish on the Lebanese-Israeli border that got all the world nervous for a bit. All the BBC shows of the Lebanese side is, horrors, Hezbollah’s Nasrallah, giving his usual fiery oratory, this one on the anniversary of the 2006 Israeli invasion, which coincidentally was the same day. The latest incursion was a “misunderstanding” wherein Israeli soldiers uprooted some trees with a bulldozer (curious as a weapon, no? now associated with Israeli aggression in my mind--RACHEL CORRIE!!). Before we decided to hop a plane to Rhodes, and the border drama, I was going to write of the remarkable normalcy of life in Beirut. How much has changed since we arrived in 2007! Pleasure boats, lots of them, now populate harbors and previously hidden moorings. A big new Hilton is about to open along the Corniche downtown, the latest in a series of chains: Four Seasons, Ramada, Hyatt. Tourists on every other street corner, and populating the historic sites we used to visit all alone. Back in Rhodes, “basilico” (basil) in pots on restaurant terraces, deep green and fragrant. "Rush hour" in a town brochure is listed at “22 – 24h”; a restaurant advertises Happy Hour from 9 – 11 pm. The rows of beach chairs are set up with their backs facing the sea—fronts to the sun. Not surprisingly, many of the gazillion tourists here have that baked ham look skin. Women parade through town in bikinis, men in trunks. Numerous pot bellies, some naked breasts sunbathing, tons of Germans, also Italians, French, Scandinavians, some US, some Lebanese. Everyone is relaaaaaaxed. It’s a whole a whole culture, package tourism—one we’ve never experienced before. In the vast room where the masses gather to surf the 50 foot long buffet table at dinner, staff seem startled when you offer a greeting or even a smile. Guests coming in to sit at a table next to us might offer a hello, or more likely a guten tag, but otherwise there is no contact. The bus driver taking us to the airport is so shocked when T says “Good morning” that he shakes his hand and asks his name. 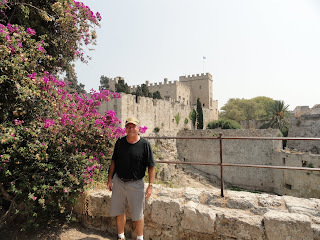 We spend little time at the beach ourselves, and walk about every inch of Rhodes ol d town, which is surrounded by a magnificent, intact wall complete with moat, now dry. We hopped a bus one day down the east coast to Lindos, atop a gorgeous bay. Jam packed with tourists. Topped by an acropolis. Our brief escape at an end, at Rhodes airport we pass an Easyjet apparatus for measuring you carry-on bag , board a Swissport bus and climb a Swissport stairway to the Royal Jordanian plane to Beirut.